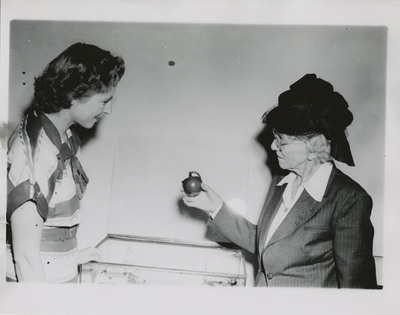 Marguerite Lewis (left), Professor of Home Economics, speaks with an unknown woman in a black hat. Linfield College Archives Photograph Collection. Jereld R. Nicholson Library. Linfield College, McMinnville, Oregon. Unknown, "Professor Marguerite Lewis" (1948). Linfield College Archives Photograph Collection. Image. Submission 247.